Update 7/17/17: This article has been updated to more clearly depict the pavilion's construction and disassembly. 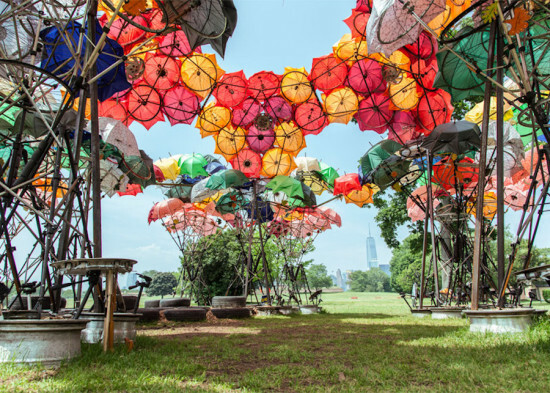 The seventh annual City of Dreams Pavilion, dubbed Cast & Place and designed by Team Aesop, is now open to the public on New York City’s Governors Island. The interdisciplinary team, made up of architect Josh Draper of New York–based PrePost, Lisa Ramsburg and Powell Draper of engineering consulting firm Schlaich Bergermann Partner, Edward M. Segal of Hofstra University, Max Dowd of the Cooper Union, Max Dowd of Grimshaw Architects and sculptors Scot W. Thompson and Bruce Lindsay, won the competition back in March with their design that reimagines metal waste as a resource for the future of the city. The competition is run by FIGMENT, the Emerging New York Architects Committee (ENYA) of the American Institute of Architects New York Chapter (AIANY), and the Structural Engineers Association of New York (SEAoNY). The brief asks designers to rethink the environmental impact of their designs and to promote sustainable design strategies in light of a future that faces the depletion of natural resources. 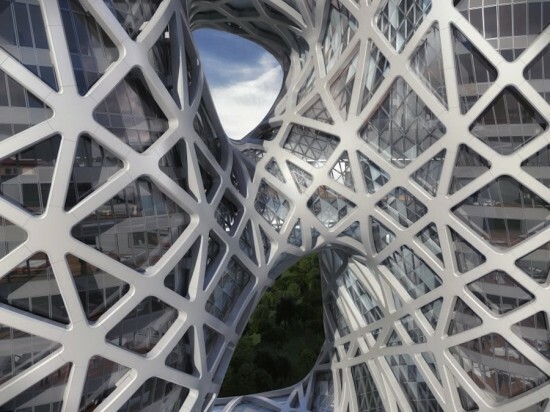 Cast & Place’s winning design proposed using material entirely made from waste: five tons of excavated clay for the structure’s framework and 300,000 recycled aluminum cans (that would be melted and re-cast) for the structured itself. The team had previously built a small-scale prototype of the panel to test out potential challenges, as the method of fabricating crack-cast aluminum had never been done before, according to Josh Draper. The prototype proved useful, highlighting difficulties that would have been hard to anticipate otherwise. Despite the team’s expectation that they were going to use solely aluminum cans, the melted mix of food trays, foil, and cans produced an inconsistent alloy. Instead, for their final structure, standard aluminum ingots were used to ensure consistent quality and timeliness. “There were metallurgical and production issues that we couldn’t take on with our schedule and budget,” Draper said. 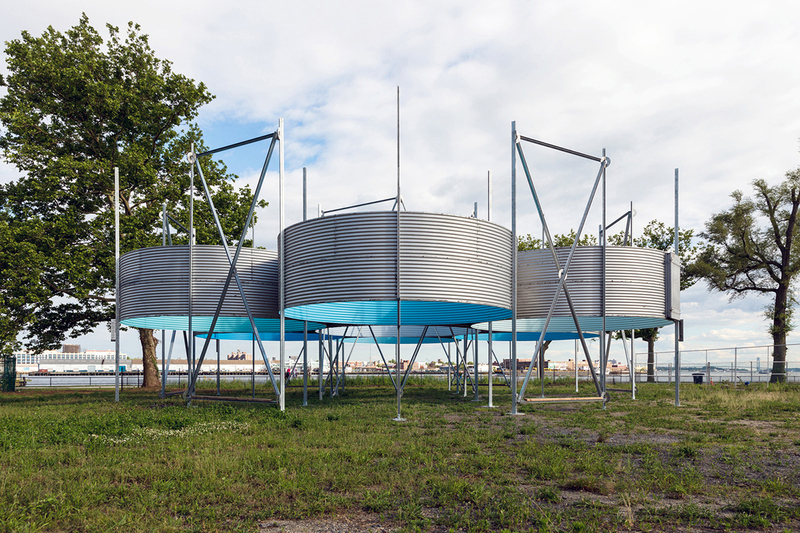 However, he added that “this project prototyped a new method that has potential.” The original proposal also featured two side-by-side aluminum frame structures, however, only one was installed on Governors Island (which worked out well, as the site was smaller than anticipated). The fabrication of the pavilion required a new mold technique: wet clay was laid out to dry and crack in plywood frames, where it was then transferred to a steel mold and secured with sheetrock and cement. Steel straps bound the mold assembly to control escaping steam. Once the aluminum cooled and solidified, it formed one cohesive panel. 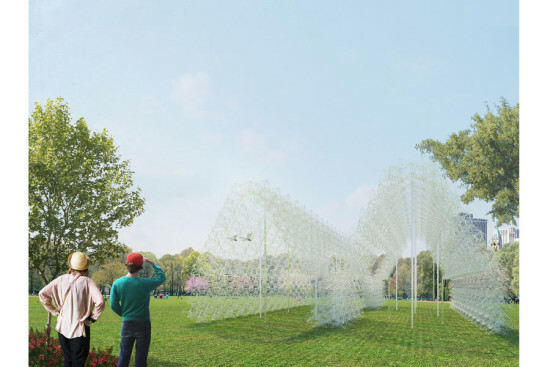 When the pavilion is disassembled, it will be recycled and turned into benches and trellises for the people who backed the project on Kickstarter. 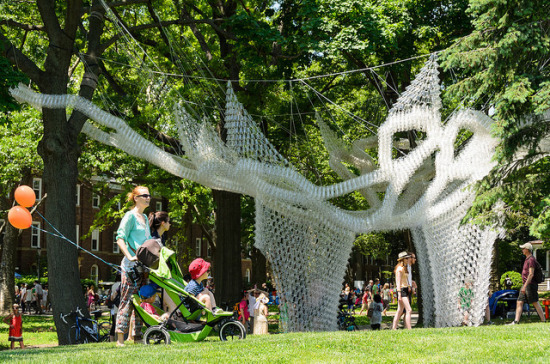 “It’s the beginning of a long conversation and collaboration with the public on waste, structure, and light,” Draper said. 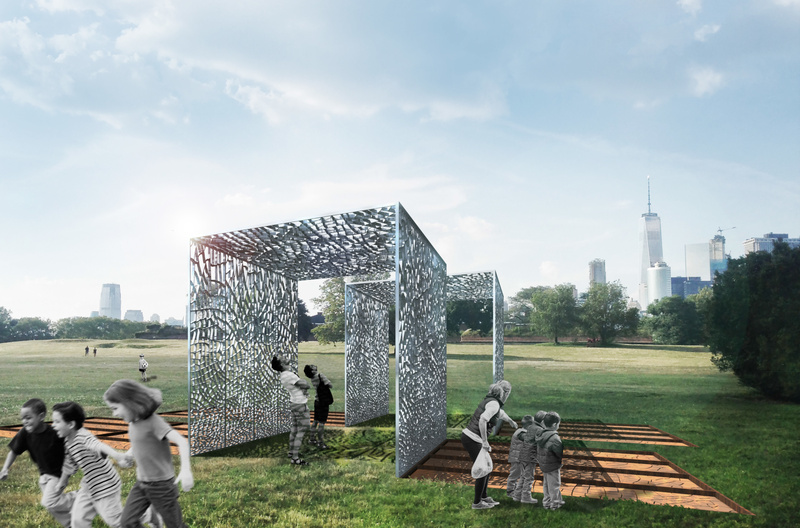 “We wanted to create a space for contemplation, to provoke questions about what material and waste can be, to invite people to touch and wonder.” The City of Dreams Pavilion is located on the North Side of Governors Island (across from Castle Williams) and is running until October 17. The pavilion is an evocation of childhood memories: a large corn field sheltered under a light canopy, where visitors can relive a first hidden kiss, a game of hide and seek, a nap, or a racing slalom through twisting paths. The pavilion will use slalom gates, which are useless during summer, borrowed from a ski resort outside NYC and returned for the next ski season. Nooks and Granny Squares invites visitors to experience different spaces created by dome-shaped structures and a tactile skin. 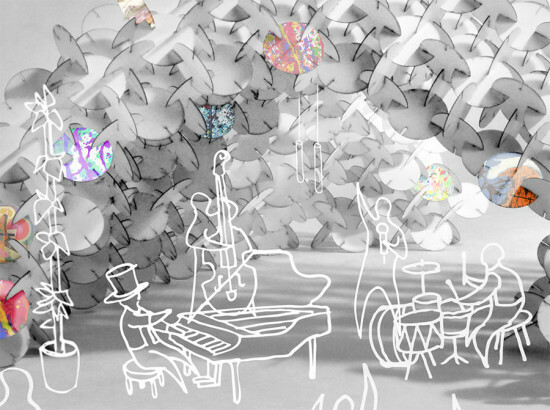 The main public space, formed by two large domes, allows visitors to gather in the shade and enjoy a performance. 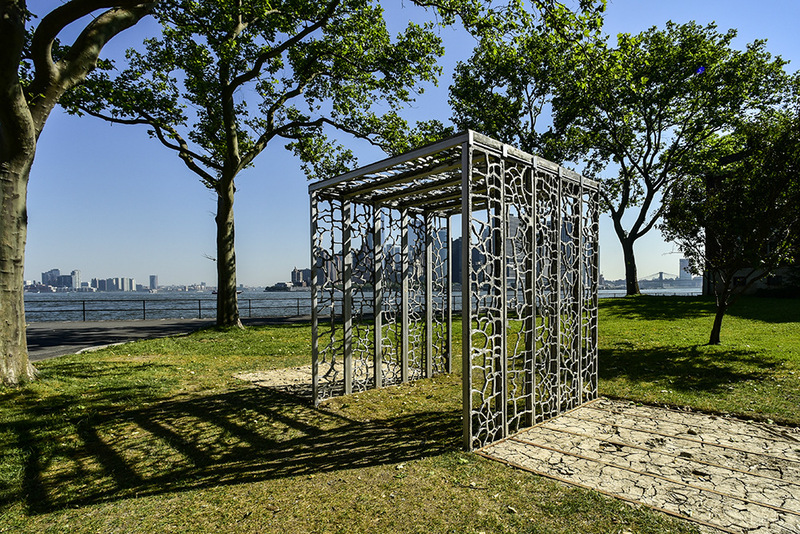 The crocheted skin is comprised of panels made up of recycled plastic bags and separates a semi-private interconnected cove from the main space, while partially open to the views of Governors Island. 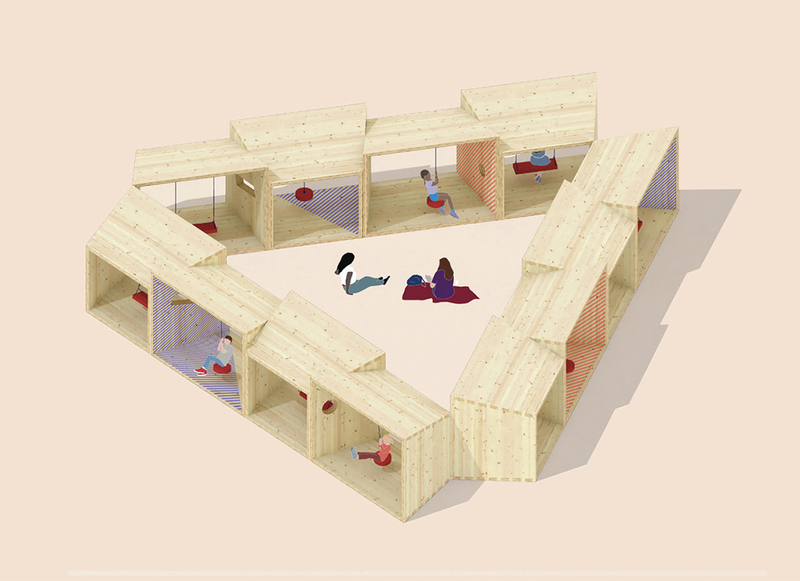 The nook, independent from the other domes, functions as a snug and private space for up to four people. Open and closed weaves allow light to filter into the pavilion during the day and escape at night, creating memorable moments at any time of the day. The Pneu Pavilion is a lightweight, air filled structure suspended at varying heights to create a smooth gradient between tall and short spaces, accommodating a wide range of age groups and activities. 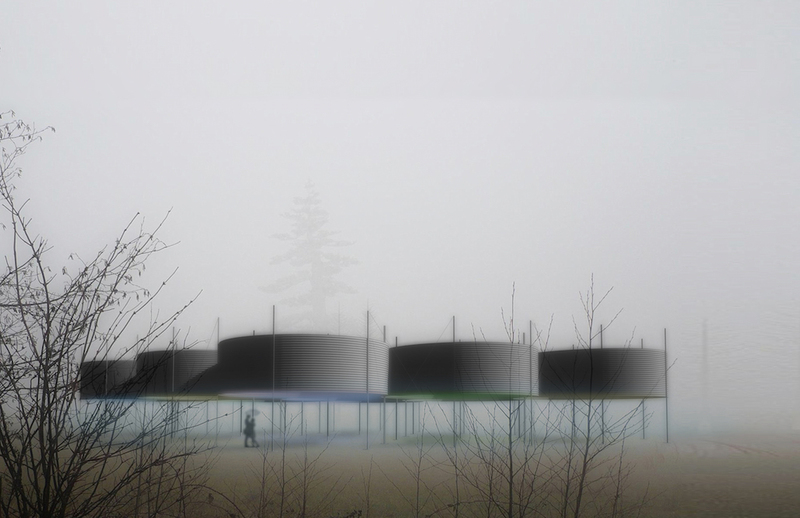 The tensile structure is made entirely from demountable and reusable structural components, while the inflated structural pillows are built from recycled vehicle inner tubes contained within layers of porous mesh. The air pressure in the skin allows the thin material to achieve the large span between the lenticular cable trusses, providing a soft surface that encourages viewers to interact with it, while the repeating pillow-like forms give the canopy a cloud-like appearance.